The Pleiades, also known as the Seven Sisters or Messier 45, is a famous open star cluster located in Taurus constellation. The brightest stars in the cluster represent the Pleiades, the Seven Sisters in Greek mythology, and their parents, the nymph Pleione and the Titan Atlas. 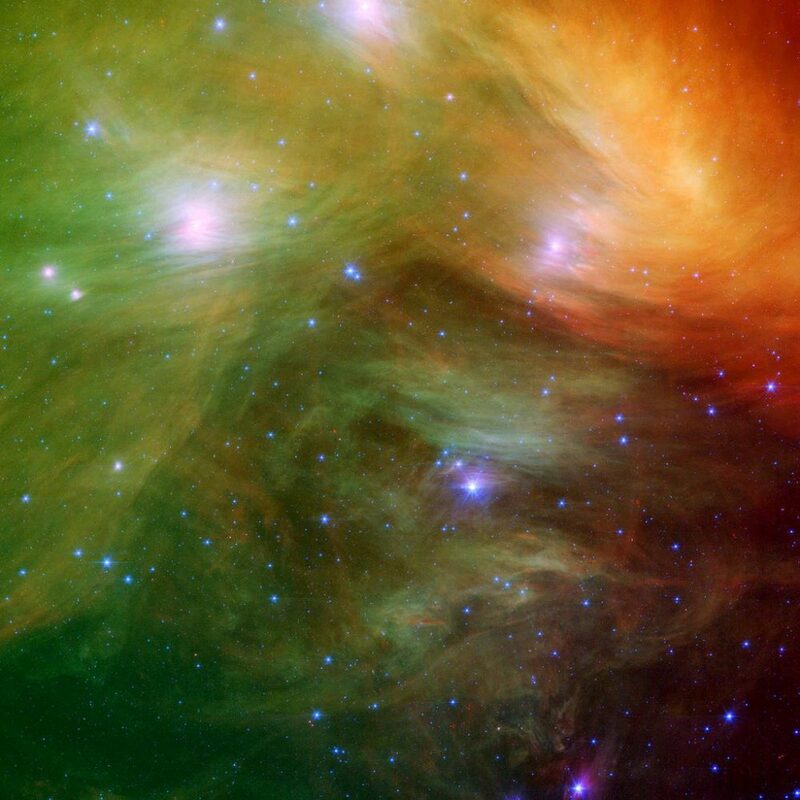 Messier 45 is one of the nearest star clusters to Earth. Its brightest stars lie at a distance between 390 and 460 light years. The cluster is mostly composed of hot, blue, highly luminous stars belonging to the spectral class B with an estimated age under 100 million years. The Pleiades (pronunciation: /ˈplaɪ.ədiːz/ or /ˈpliːədiːz/) star cluster is about 110 arcminutes in size and has an apparent magnitude of 1.6. It is the easiest star cluster to find in the sky, mainly because of its brightness and size, and it is well known in many different cultures and mythologies. 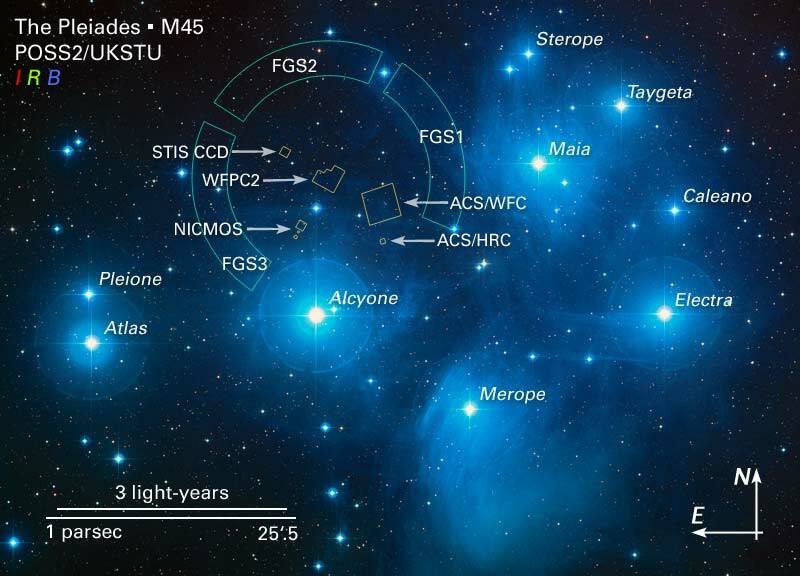 The earliest images of the Pleiades cluster date all the way back to the Bronze Age. 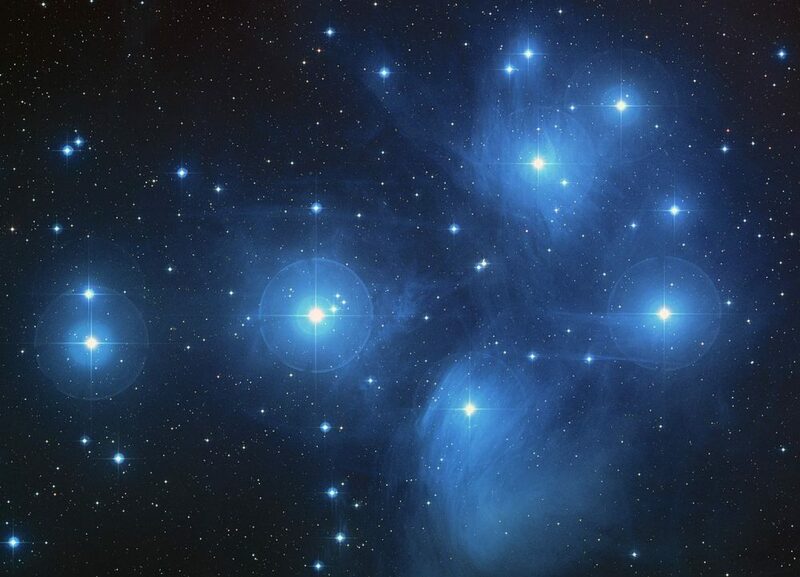 The Pleiades cluster contains more than 1,000 stars, not including unresolved spectroscopic binary stars. Up to 14 stars in the cluster are visible to the naked eye in good viewing conditions. The estimated mass of the cluster is equal to 800 solar masses. M45 also contains a significant number of brown dwarfs; they are believed to constitute up to 25 percent of all the stars in the cluster, but as they generally have less than 8 percent of the Sun’s mass, the brown dwarfs in M45 contribute less than 2 percent to the total mass of the cluster. The cluster has a tidal radius of approximately 43 light years, and the core radius is about 8 light years. 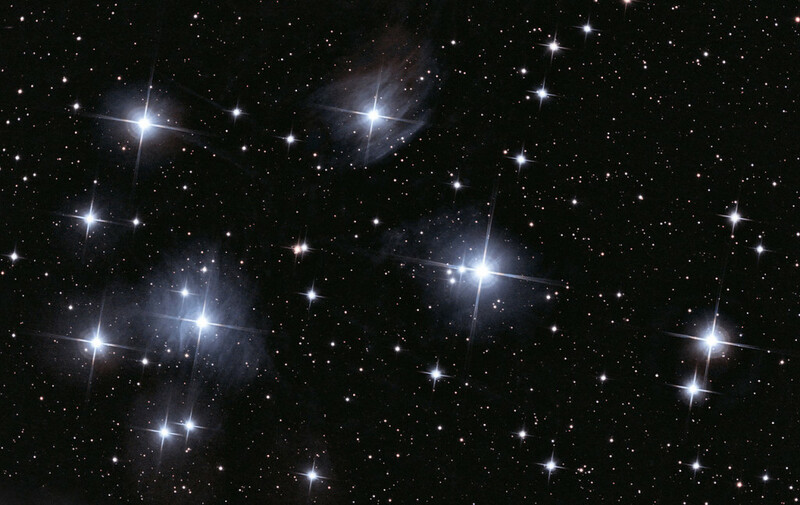 The brightest stars in the Pleiades cluster are surrounded by a faint reflection nebula, sometimes known as the Maia Nebula (NGC 1432), after one of the Seven Sisters. The nebula is a cloud of dust illuminated by the hot, luminous stars in the cluster, which are currently passing through the nebulosity. The estimated age of the cluster is between 75 and 150 million years. The stars are gravitationally bound and are moving in the direction of Orion’s feet. Messier 45 will exist for another 250 million years or so, after which the stars will disperse as a result of interaction with other stars, molecular clouds, and the spiral arms of the Milky Way Galaxy. The cluster appears prominently in the sky in winter in the northern hemisphere and in summer in southern latitudes. It is located to the west-northwest of Aldebaran, the brightest star in Taurus, and pretty easy to find on a clear night. The Seven Sisters are most prominent between October and April. In early November, the cluster rises in the east after sunset. In February it lies overhead in the evening. In May, it sets at sunset, before Orion. As the cluster lies near the ecliptic (the Sun’s path across the sky), it can’t be seen in May and June, because it is located too close to the Sun. When M45 is directly overhead, it can be found by following the line from Orion’s Belt. The Pleiades cluster also contains the Merope Nebula (NGC 1435), a diffuse reflection nebula 30’ in size, suspected to be a supernova remnant. The nebula is also known as Tempel’s Nebula, after Wilhelm Tempel, the German astronomer who discovered it on October 19, 1859. The Merope Nebula surrounds the star Merope and has a visual magnitude of 13. The Merope Nebula contains IC 349, a small bright knot , 0.5’ in diameter, which is an extension of the larger NGC 1435. IC 349 is sometimes also known as Barnard’s Merope Nebula because it was discovered by Edward Emerson Barnard in November 1890. It is located 36 arcseconds (0.06 light years) to the southwest of the star Merope. 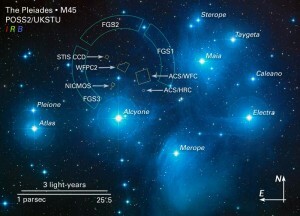 The brightest stars in the Pleiades cluster are Alcyone (Eta Tauri or 25 Tauri), Atlas (27 Tauri), Electra (17 Tauri), Maia (20 Tauri), Merope (23 Tauri), Taygeta (19 Tauri), Pleione (28 Tauri or BU Tauri), Celaeno (16 Tauri), Sterope (21 and 22 Tauri), and 18 Tauri. Alcyone (pronunciation: /ælˈsaɪ.əniː/) has a visual magnitude of 2.873 and belongs to the stellar class B7IIIe. The star is about 370 light years distant from Earth. It is the brightest of the Seven Sisters and the third brightest star in Taurus constellation, after Aldebaran, Alpha Tauri, and Elnath, Beta Tauri. Alcyone is classified as an eclipsing binary star. The primary component is a blue-white giant star (B7IIIe) 2,400 times more luminous than the Sun and with ten times the solar radius. The star has a projected rotational velocity of 215 km/s, which makes it a very fast spinner, and as a result it is surrounded by a gas disk at the equator. The binary companion is separated by 0.031 arcseconds. The eclipsing binary system has three companions: two 8th magnitude white main sequence stars belonging to the spectral class A, one of which is classified as a Delta Scuti variable, and a yellow-white, class F dwarf. Atlas, named after the Seven Sisters’ father, is the second brightest star in the cluster. It is a triple star system with the stellar classification of B8III. It has a visual magnitude of 3.62 and is approximately 381 light years distant from Earth. The Atlas system contains a spectroscopic binary star, with individual components too close to be resolved. The stars have apparent magnitudes of 4.1 and 5.6 and orbit each other with a period of 1,250 days. The binary star has another companion, a faint star with a visual magnitude of 6.8, separated by 0.4 seconds of arc. Electra is another blue-white giant star in the Pleiades cluster. It belongs to the stellar class B6 IIIe. With an apparent magnitude of 3.705, it is the third brightest star in M45. It is about 600 light years distant from Earth. Electra is another fast spinner. It has a projected rotational velocity of 181 km/s. As a consequence, it is stretched at the equator and flattened at the poles, and because of the mass loss caused by its rapid spinning, the star is surrounded by a disk of gas and emits excess infrared radiation. Maia is also a blue-white giant star. It has the stellar classification of B8III. It has an apparent magnitude of 3.871 and is about 360 light years distant from Earth. It is one of the stars surrounded by the emission/reflection nebula NGC 1432, also known as the Maia Nebula. Maia has a mass four times that of the Sun, 5.5 times the solar radius, and is about 660 times more luminous than the Sun. It is classified as a mercury-manganese star. Merope (pronunciation: /ˈmɛrəpiː/) is a blue-white subgiant with the stellar classification of B6IVev. It has an apparent visual magnitude of 4.113 and is approximately 360 light years distant from Earth. The star is 4.5 times more massive than the Sun and about 630 times more luminous. It has a radius four times that of the Sun. 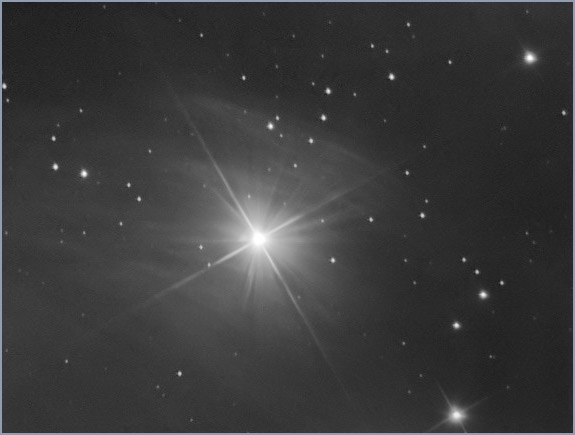 Merope is a Beta Cephei type variable. Its brightness varies by 0.01 magnitudes. It is the central star in the Merope Nebula, a nebula through which the Pleiades cluster is currently passing. The nebula looks brightest around Merope, which is why it was named after the star. Taygeta (pronunciation: /teɪˈɪdʒɨtə/) is a triple star in the cluster. It has the stellar classification of B6V, matching a blue-white main sequence dwarf. It has an apparent visual magnitude of 4.29 and is about 440 light years distant from Earth. The primary component in the system is a spectroscopic binary star whose components have visual magnitudes of 4.6 and 6.1. The two stars are separated by 0.012 arcseconds and have an orbital period of 1,313 days. The binary star has an 8th magnitude companion which is separated by 69 seconds of arc. Pleione (pronunciation: /ˈplaɪ.əniː/) is a double star belonging to the stellar class B8IVpe. It has a visual magnitude of 5.048 and is about 392 light years distant from Earth. The star is not easy to see without binoculars because it lies close to Atlas, which is 3.7 times brighter. The two stars are separated by less than 5 minutes of arc. Pleione is a hot blue star with a mass 3.4 times that of the Sun and a radius 3.2 times solar. It is significantly smaller than the other bright stars in the cluster. It is about 190 times more luminous than the Sun and it spins close to its breakup velocity, at 329 km/s. The star is classified as a Gamma Cassiopeiae variable and has the variable designation BU Tauri. Its brightness varies from magnitude 4.8 to 5.5. Gamma Cassiopeiae variables, also known as shell stars, are fast spinning stars surrounded by a disk of gas at the equator. They exhibit irregular changes in luminosity as a result of the outflow of matter. Pleione is known to be a spectroscopic binary star, with components that cannot be resolved because they are separated by only 0.2 seconds of arc. The two stars in the system have an orbital period of 218 days. Celaeno (pronunciation: /sɨˈliːnoʊ/) is sometimes known as the Lost Pleiad because it often cannot be seen without binoculars. In less than ideal observing conditions, stargazers can only see six of the Seven Sisters and Celaeno is missing. The star is a blue-white subgiant belonging to the stellar class B7IV. It has a visual magnitude of 5.45 and is about 430 light years distant from Earth. It has about 9-10 solar masses and a radius 4.4 times that of the Sun. It is another fast spinner in the cluster, with a projected rotational velocity of 185 km/s. Sterope, or Asterope (pronunciation: /ˈstɛrɵpiː/, or /əˈstɛrɵpiː/), is a name shared by two stars, designated 21 and 22 Tauri, separated by 0.04° in the sky. 21 Tauri has the stellar classification of B8V, which makes it a blue main sequence dwarf. It has a visual magnitude of 5.76 and is about 440 light years distant from Earth. 22 Tauri belongs to the stellar class A0Vn. It is a white main sequence dwarf, also about 440 light years distant. It has an apparent visual magnitude of 6.43. 18 Tauri, not associated with a mythical figure or given a proper name, is a blue-white main sequence dwarf belonging to the stellar class B8V. It has an apparent visual magnitude of 5.65 and is also one of the brightest stars in the cluster. In Greek mythology, the Pleiades were the seven daughters of Pleione, a sea nymph, and the Titan Atlas. The seven nymphs were sisters to the Hesperides and the Hyades, and they were companions of the goddess Artemis. Their name was derived either from their mother’s name, Pleione, or from the Greek πλεῖν, which means “to sail,” in reference to the nymphs’ role in delimiting the sailing season. 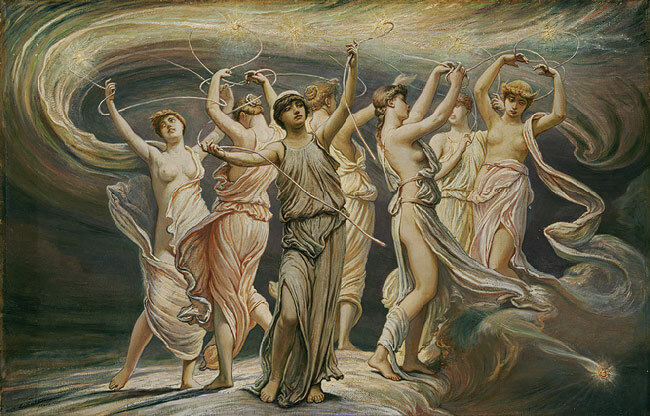 The seven sisters were Maia, Electra, Taygete, Alcyone, Celaeno, Sterope and Merope. The Pleiades were very well known in Greek culture. The Hecatompedon temple and the Parthenon were oriented to their rising. In Greek mythology, when Atlas was tasked with carrying the heavens on his shoulders as punishment for siding with the Titans in their war against Olympian gods, the hunter Orion started pursuing his daughters in his absence and Zeus turned the sisters first into doves and then into stars to protect them from the hunter’s advances. The constellation Orion, it is said, still pursues the Seven Sisters across the sky. The Pleiades were also pursued by several Olympians, to whom they bore children who grew up to be prominent figures in Greek mythology. Maia, the eldest of the seven sisters, had an affair with Zeus which resulted in the birth of their son Hermes, who later became the messenger of the gods. Electra and Taygete also had children by Zeus. Electra gave birth to Dardanus and Iasion, and Taygete was mother to Lacedaemon. Dardanus founded the city of Dardania on Mount Ida on the Hellespont. The strait’s modern-day name, the Dardanelles, was derived from his name. Dardanus’ son Tros’ name is the origin of the name of the region Troad, and Tros’ son Ilus founded the city of Ilium, more commonly known as Troy. Iasion established the mystic rites on Samothrace and had twin sons with the goddess Demeter. Zeus killed him with a thunderbolt after realizing the two had an affair. Lacedaemon ruled the country which he named after himself, also naming the capital after his wife, Sparta. Alcyone and Celaeno both had children by Poseidon. Alcyone gave birth to Hyrieus (father of Orion according to some sources), Hyperenor (who co-founded the cities Hyperea and Anthea) and Aethusa (Apollo’s lover, after whom the portico open to the sun was named), and Celaeno was mother to Lycus and Eurypylus. Sterope had a child with Ares. Oenomaus, their son, was the king of Pisa and the father of Hippodamia. Fearful of a prophecy that said he would be killed by his son-in-law, Oenomaus killed a number of his daughter’s suitors in a chariot race. Hippodamia eventually married Pelops, and their offspring included Agamemnon, Menelaus, Atreus, Thyestes, Aegisthus, and Orestes. Merope, the youngest Pleiad, married Sisyphus and bore him several sons.